Up until a few years ago, I’d turn on the TV and find myself humming Springsteen’s “57 Channels and Nothin’ On” as I flipped through one boring channel after another. Not anymore! With internet-only streaming services like Netflix, Amazon Video, and Hulu bringing out original content on an almost-weekly basis, there’s never a shortage of something new and interesting to watch. In fact, there are so many new shows releasing across the various streaming services at any given time that it’s actually become a problem to keep track of all of them. Of course, each service lets you store your own list of must-see shows, but there’s a flaw: you can’t share your watchlist between services. So, I decided to solve this problem by building an IBM Cloud application to store my personal watchlist for movies and TV shows in a service-agnostic fashion. This tutorial shows you the steps I followed to create this app. Develop a PHP-based web application for IBM Cloud. Integrate data from a third-party REST API with your IBM Cloud application. Create an application initialization script. Integrate the Twig template engine. Create the application home page. Connect to The Movie Database API. Process search queries and display search results. To start, initialize a basic application with the Slim PHP micro-framework. Create the directories $APP_ROOT/public for all web-accessible files and $APP_ROOT/templates for all page templates. Here, $APP_ROOT refers to your local working directory, which is named myapp in this example. If you have an Apache and PHP7 development environment (optional), you should point your Apache Web server’s document root to $APP_ROOT/public. This code initializes the Slim Twig extension and configures it to look in the $APP_ROOT/templates directory for template files. With this code in place, the Twig engine can be accessed from any of the Slim callback handlers with $this->view. Slim works by defining callback functions for HTTP methods and endpoints. It calls the corresponding Slim method – get() for GET requests, post() for POST requests, and so on. It passes the route to be matched as the first argument to the method. The second argument to the method is an anonymous function, which specifies the actions to be taken when the route is matched to an incoming request. This file contains a simple Bootstrap-based user interface with a navigation bar, footer, and content area. In particular, note that you can override the content area from child templates, making it easy to reuse the same HTML skeleton for different pages of the application. The Movie Database (TMDb) makes an API service available free of charge for development purposes only. Like any other API, it exposes a series of web-accessible endpoints and responds to properly-authenticated API requests with data from the TMDb service. Response data is formatted as JSON. Access to the TMDb API is controlled through an API key, which you can apply for here. API requests are also rate-limited to a maximum of 40 requests in 10 seconds, and API search results must be accompanied with TMDb attribution. You can find out more about the API in the TMDb API FAQ at www.themoviedb.org/faq/api. 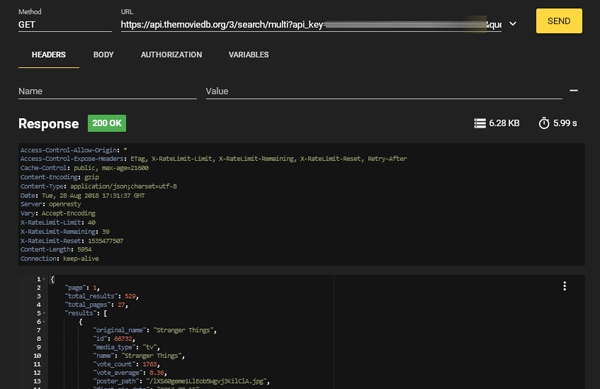 To see the TMDb API in action, fire up RESTer in your browser and send an API request to the URL endpoint https://www.themoviedb.org/documentation/api/3/search/multi?api_key=API-KEY&query=KEYWORD. Replace the API-KEY placeholder with your TMDb API key and the KEYWORD placeholder with a search term. This API endpoint performs a search across the TMDb database and returns a list of movies, TV shows, and personalities to match the specified query term. For a complete description of the available API methods and responses, see the TMDb API documentation at the Getting Started page for the Movie Database API. Next, initialize the Guzzle HTTP client and add the client object to application code through the Slim dependency injection container. You use this HTTP client object to send requests to the TMDb API from within the application. With this code in place, you can access the Guzzle HTTP client from anywhere in the PHP script using $this->tmdb. It receives POST submissions from the search form and checks and sanitizes the submitted input. t uses the Guzzle HTTP client object from the Slim dependency injection container to send a GET request to the TMDb API. It incorporates both the search terms and the API key from the application configuration file. It checks the HTTP client response code and if it receives a successful response code (HTTP 200), it transforms the JSON response packet into a PHP object that contains the search results. It renders the search results page and provides the page template with the search results as a variable. This template uses Twig’s inheritance feature to extend the home page template created earlier and replace the “content” block with a table containing the search results returned by the TMDb API. A loop iterates over the results array and displays each individual result as a row in the rendered table. 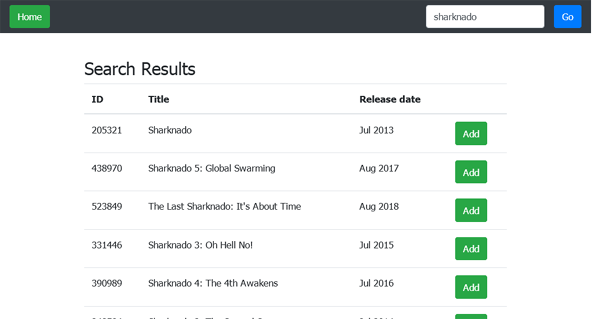 Within the results array, personality results are filtered out and movie and TV show results are displayed together with their ID and year of release. Each result is accompanied by an Add button. The button doesn’t do anything yet, but you add the necessary functionality for it in the second part of the tutorial. A micro-framework that supports dependency injection gives you greater control and flexibility in invoking specific libraries as needed. Most micro-frameworks also provide the additional bonus of decoupling application URL routes from the filesystem structure of the code. A template engine that supports inheritance lets you reduce the code you need to write (and also to create a more consistent user experience). It builds a base interface layout that can be reused everywhere but also overridden for specific use cases. A secure, stable and extensible HTTP client library that works independently of system libraries should be a key component of any project that integrates content from third-party APIs. At the end of this first tutorial in the series, you have a working PHP application that is integrated with The Movie Database’s search API and able to return a list of movies and TV shows that match your keywords. You also have a basic understanding of how routing, page templates, and dependency injection work with Slim PHP applications. The second part of this tutorial builds on what you learned by adding more functions to the application, integrating it with a Cloudant database running in the IBM Cloud, and then deploying the result to IBM Cloud using a CloudFoundry PHP buildpack.